2. Nars Velvet Matte Lip Pencil in Mysterious Red. 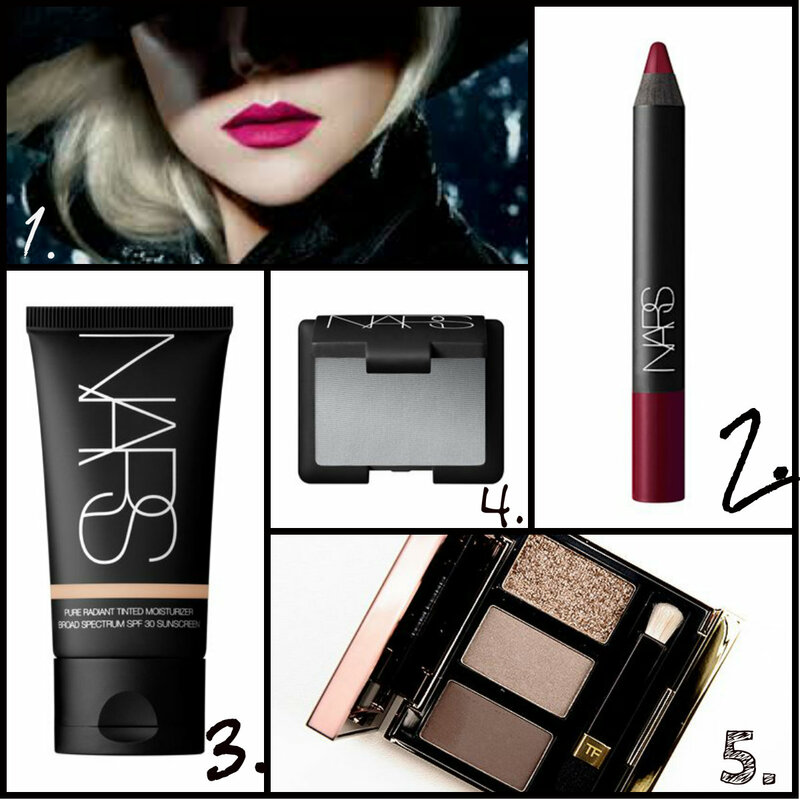 I’m a big fan of the velvet matte formula and Nars in general. This is a stunning shade of red and it will be mine. 3. Nars Tinted Moisturiser in Terre Neuve. While I’m not a fan of bb’s, cc’s, dd’s (seriously, it’s a thing), I’m strangely intrigued by Nars’s tinted moisturiser offering. It could be that it’s supposed to have great coverage, so really more of a light foundation than a tinted moisturiser. One for great skin days and lazy Sundays methinks. 4. Nars Namibia single eyeshadow. Having recently purchased Lhasa and been very impressed with the formulation, I am now lusting after this lovely pale grey from the Fall 2013 Collection. I’ve been on the lookout for a light grey, not silver, not sparkly, no lavender tint, for a quite a few years now. You wouldn’t think it would be that hard to find, but alas, it is. I think I may have found the illusive shadow in Nars Namibia. 5. Tom Ford She Wolf trio. Look at it, I mean seriously….just LOOK at it. It’s beautiful. I am a magpie at heart and it’s just sparkly and pretty and €56….YES I know. Time to start saving the pennies, this one is not cheap & it’s Limited Edition so if you want it, snap it up quickly. But boy is it pretty, and the case is pretty fab too. So these are the things that are keeping me awake at night this month. Have you tried any, what did you think of them? G’wan, make me jealous. Beautiful picks I want everything here too! I love this september wishlist. I love Nars velvet matte texture. I have train bleu and it so nice. I have tried the matte formulas by Mac which have gotten better since Runy Woo. I would like to try Tom Ford eyeshadows. Thank you. I love the velvet matte pencils too and would love to try Tom Ford. I haven’t tried the Mac matte lipsticks yet but that will change soon I suspect. Did I not tell you before? Bad Evie!! Bad bad. If you register for emails they’ll send you a code for a free mini illuminator or blusher, it changes every now & again. Oh Evie you’re quite the divil!! I’m going through a lipstick/lip pencil obsession at the moment! I love the look of the Retro Matte Collection! I have yet to buy a Mac Lipstick, no idea what to pick as my first colour! What kind of shades are you into? Well for red I suppose there’s always Ruby Woo. For a subtle pale nudey pink maybe Patisserie? I don’t have either but they’re both very popular shades. I have a matte red from maybelline that I think is a right dupe for Ruby Woo! I’ll have a gawk now the next day I’m in BT at the Mac counter, I wish we had a Nars though! I’m developing a deep lusting from you and your love for them! I would kill to have a Nars counter nearby. Such a pity there isn’t more than one in the country. Actually, they sell some of the Nars products on Asos and I think some of them might be cheaper there!! Yeah some are less expensive, some are more, depends what you need. I buy mine direct from Nars cause they email out freebie codes fairly regularly & they do free shipping if you spend over €50.